Good Battery life, a little on the quiet side, but do the job. Noise cancelling seems to be working then. Maybe put the model in the description. Sony sell a number of noise cancelling headphones. Got these for £71.99 at Christmas from Amazon. Good Battery life, a little on the quiet side, but do the job. This is better or Sennheiser 4.5 ? Yeah, nothing special. Only use these headphones with the iPad. But if you are getting them for the noise cancelling especially. Probably better looking at some other headphones. Just saw the ratings on these apparently has better sound overall than XM3 but noise cancelling is bad. I bought them off Amazon for the same price, except Amazon does three colours, Also I love the returns policy. Picked these up for £66 'like new' from Amazon with their 20% Easter warehouse discount. Very impressed so far. Yeah, nothing special. Only use these headphones with the iPad. But if you …Yeah, nothing special. Only use these headphones with the iPad. But if you are getting them for the noise cancelling especially. Probably better looking at some other headphones. I had a pair of these on a long haul flight last year. I didn't realise what a good job they were doing until I took them off to talk to the stewardess. Even in ordinary circumstances when paused their NC works so well that you have to take them off to clearly hear what people are saying. They do have a design flaw with the button placement though. If you are wearing a high collar or scarf you have to be careful, when tilting your head to the left, that you don't press too long on the power button and switch them off. I had a pair of these on a long haul flight last year. I didn't realise …I had a pair of these on a long haul flight last year. I didn't realise what a good job they were doing until I took them off to talk to the stewardess. Even in ordinary circumstances when paused their NC works so well that you have to take them off to clearly hear what people are saying. They do have a design flaw with the button placement though. If you are wearing a high collar or scarf you have to be careful, when tilting your head to the left, that you don't switch them off. I think I am just used to Monster Inspiration for noise cancelling. They literally silenced the outside world rather than muffled them. Maybe put the model in the description. Sony sell a number of noise …Maybe put the model in the description. 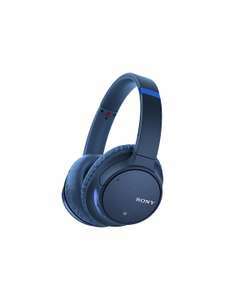 Sony sell a number of noise cancelling headphones. Are you going to be more comprehensive when you get around to posting some deals? Picked these up for £66 'like new' from Amazon with their 20% Easter …Picked these up for £66 'like new' from Amazon with their 20% Easter warehouse discount. Very impressed so far. Are you going to be more comprehensive when you get around to posting some …Are you going to be more comprehensive when you get around to posting some deals? Yes, I would post only the best descriptions. The best. I am big fan of Sony for the quality and durability they deliver with their headphones. This is a best noise cancelling headphones in the market at that price, and if you have not used noise cancellation headphones you will feel the difference and will enjoy it. Even audiobook listening experience is exceptional which was not on my expectation list. Very happy with this purchase.